Cats are clever animals and are often hopelessly under-stimulated in indoor life. 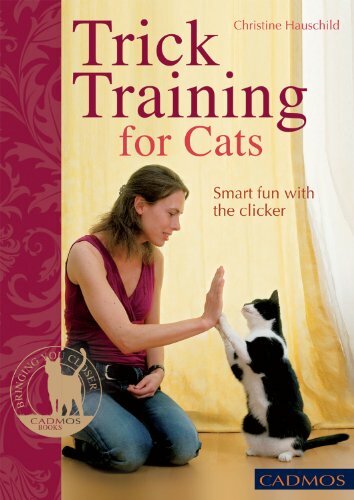 This book shows cat owners how to nurture their cat both in body and mind and how to teach them a variety of different tricks and exercises using clicker training in a cat-friendly way. Great fun for owner and cat, this guide walks owners through planning and preparing training; explains the three paths to the perfect trick: shaping, luring, and capturing; and demonstrates how to smooth the path to the first tricks. It covers such easy tricks as begging, jumping over an obstacle, rolling over, and washing; offers solutions to possible difficulties, and includes directions for trick training with more than one cat. If you have any questions about this product by Brand: Cadmos Publishing, contact us by completing and submitting the form below. If you are looking for a specif part number, please include it with your message.